Each week, North Omaha historian Adam Fletcher Sasse takes listeners on a dynamic journey into Omaha history! His topics cover the people, places, events and more that shaped Omaha into the great city it is today. Subscribe on iTunes or listen to the episodes using the links below. Want to support us? Become my patron on Patreon! Patrons of the North Omaha History Podcast get a free gift! Here is a list of each of the episodes featuring North Omaha history available right now. Imagine a time when riding a streetcar was interesting, respected and almost a little glamorous. On the dusty, granite-covered streets of Omaha, that time was during the 1870s and 1880s. That new technology needed fanciful buildings to go along with the times, and the streetcar maintenance shop at 2606 North 26th Street in North Omaha was one of those buildings. But then a few weeks ago, they tore it down! In the 1860s, the Union Pacific established its shops north of downtown Omaha, and Scandinavians came to work there. The largest populations to settle in Nebraska were in North Omaha. Scandinavians also had homes in other parts of Omaha, but between 1860 and 1919, the vast majority lived north of Dodge and west of North 30th Street. Reed’s Ice Cream was a popular business that opened in Omaha in 1930, and operated into the early 1960s. Their signature bungalows were strategically spread throughout the community, and heavily anchored in several North Omaha neighborhoods. So, what happened to Reed’s? In 1927, a lawsuit tried to prevent the City of Omaha from opening an airport where Eppley Airfield is today. The judge ruled against that restriction and the City declared the area as the new Municipal Airport. Hangars were built right away, and a national American Legion event immediately drew huge crowds. This led to it being referred to as the American Legion Airfield for a short time. The airport boomed in 1929, and Adam explains what happened! In 1907, the Royal Amusement Company developed plans for 40-acres of today’s Minne Lusa neighborhood. Royal paid $65,000 to an architect named J. B. Mason to design six buildings, including a pavilion, a 2-story dance hall, two dining halls, a boat house, club house and a roller rink. The amusement park never came to exist. But Minne Lusa became the biggest subdivision in Omaha at that time. In 1930, 200 acres of land on the southwest corner of River Drive and Ponca Road were donated to the City of Omaha to become a park. It was named after Joseph B. Hummel, the long-time superintendent of Omaha’s Parks and Recreation Department, and one of the most influential parks advocates ever in Omaha. Learn all about Hummel Park, including Manuel Lisa’s time there. Nestled between the Miller Park neighborhood and Sorenson Parkway is a 150-year-old institution that’s been a powerhouse, a prison, a balloon school and neglected surplus. But at one time, it was the main destination for all troops and stores for the western side of the Missouri River. Located in the middle of the hustle and bustle is a spectacularly beautiful, formerly consecrated rental facility that few people in the entire city know about. For more than a century there was a monastery for Catholic nuns located at N. 29th and Hamilton Streets. This is the history of one of North Omaha’s hidden holy grounds. The Walnut Hill Reservoir was built as part of the original Omaha Water Works in 1882. Working with gravity, the reservoir drew water from Missouri River near downtown, bringing it uphill to N. 40th and Hamilton Streets. Within a decade of construction, that system was changed so that water was drawn from the Florence Water Works to Walnut Hill and distributed from there. This is Adam Fletcher Sasse’s history of this Omaha landmark. The waters of the Missouri River roared wild and free over its valley for thousands of years before Omaha was settled. Even after pioneers gathered on Capitol Hill for a picnic to found Omaha City in 1854, the Missouri still whipped around, flooding the area, shifting its channel and moving willy-nilly. During this time, a little nest of water in East Omaha was created. When European settlers saw it, they called it Florence Lake. Here’s Adam Fletcher’s story about this lost lake in Omaha. Join the conversation about the Execution of Cyrus Tator on Facebook! Join the conversation about the Greater America Exposition of 1899 on Facebook! Join the conversation about Native Americans in North Omaha on Facebook! Imagine a smooth, easy drive on a Saturday afternoon in the fall all of it weaving along nineteen miles of the city’s waterfront. There are long, calm curves and tall, stately oaks lining the boulevard, with walkers and bikes moving along a nice sidewalk that goes that entire distance. At evening, you turn to go home, your way lit by warm street lamps along with the glow of fireflies. This episode explores these days on Omaha’s River Drive. Join the conversation about Omaha’s River Road on Facebook! Today, North Omaha is a medical desert. With more than 40,000 residents in its boundaries, there is a stark absence of medical service providers of all kinds. Making it worse, the community is greatly under insured. That leaves people who have no insurance and no money needing to travel to other parts of the city to get care. However, that hasn’t always been the case. There have been more than ten hospitals in North Omaha throughout its 150+ year history. Listen in to learn more. Join the conversation about health and hospitals in North Omaha on Facebook! Join the conversation about the history of theaters in North Omaha on Facebook! Join the conversation about mansions in North Omaha on Facebook! In a place as old as North Omaha, there are bound to be a lot of ghost stories. Adam has researched stories about the Ghosts of Fort Omaha, the Lady in White, Carter Lake’s Burning Lady, the Immanuel Deaconess Tunnels, the Chapel at Forest Lawn Cemetery, the Ghosts at Hummel Park and North Omaha’s Missing Cemeteries. Here are some ghost stories! Join the conversation about ghost stories in North Omaha history on Facebook! Along the tree-lined streets and fine middle and upper class homes of Kountze Place in North Omaha, the staff of Omaha’s Presbyterian Theological Seminary decided in the early 20th century to start a new university. For 30 years, the neighborhood was home to the eventual University of Nebraska at Omaha, and this is the story. Join the conversation about Omaha University in North Omaha on Facebook! Horse-drawn streetcars; a battle at 30th and Ames; streetcar barns, rails and cables; and a LOT more related to streetcars is revealed in this podcast on streetcars in North Omaha! Join the conversation about streetcars in North Omaha on Facebook! Join the conversation about this Tour of North Omaha’s Wirt Street on Facebook! Join the conversation about the history of the Fort Street Special School for Incorrigible Boys on Facebook! Adam grew up in the Miller Park neighborhood. It’s a beautiful neighborhood with a variety of architectural styles in the homes, churches the school. Listen in as Adam shares the history of Miller Park. Join the conversation about the history of the Miller Park neighborhood on Facebook! Join the conversation about the history of N. 24th St. on Facebook! Adam give us the history of beautiful Fontenelle Park in North Omaha. Which world series was held there? Did the Omaha Cardinals call it home? What has become of Fontenelle Park today? Join the conversation about the history of Fontenelle Park on Facebook! Once called “Omaha’s Prettiest Mile Boulevard,” Florence Boulevard was built over the old Winter Quarter Wagon Road and was the first roadway in Omaha with electric lamps. Why was it called “Omaha’s Prettiest Mile Boulevard” and what about all those tunnels? Adam Fletcher Sasses tells the story. Join the conversation about the history of Florence Boulevard on Facebook! The Early History of Carter Lake includes the Carter Lake Club and much more! For more than 50 years, Carter Lake was Omaha’s playground. A streetcar brought Omahans to the Omaha Municipal Beach, four resorts, the Omaha Auto Speedway, Bungalow City and more! Come back in time to Cut-Off Lake aka Lake Nakoma aka Carter Lake. Join the conversation about this topic on Facebook! Listen to a history of the Florence Water Works and the Minne Lusa Pumping Station on the North Omaha History Podcast! Join the conversation about the history of the Florence Water Works on Facebook! Adam tells us about a popular 50s attraction in Carter Lake: Kiddieland and the Pleasure Pier. It could hold up to 20,00 people! When did it close? What’s left of it? How do you find the remains? Join the conversation about the history of Kiddieland and Pleasure Pier on Facebook! 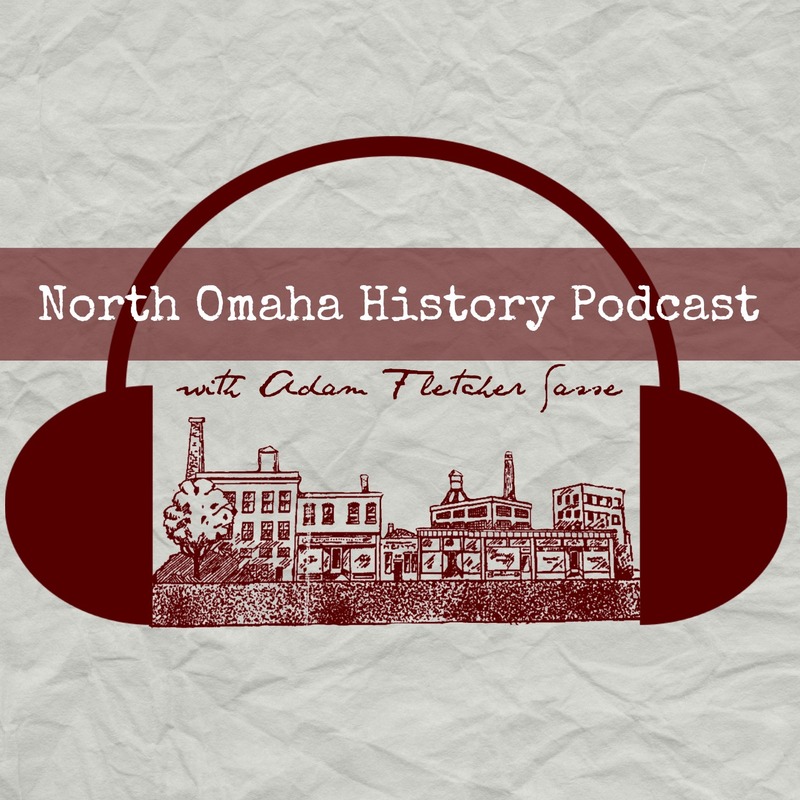 Click here to listen to the North Omaha History Podcast about the history of Schools in North Omaha! Starting in the 1840s, Adam walks us through schools among the Mormons in Cutler’s Park, Winter Quarters and Florence. In the 1860s we hear about Saratoga, then DeBolt in the 1870s. Adam shares the story of Omaha’s first African American teacher, explores the original University of Omaha and explains how at least 10 North Omaha school districts were folded into Omaha Public Schools! Join the conversation about the history of North Omaha schools on Facebook! Click here to listen to the North Omaha History Podcast episode 9 about Saratoga! Adam Fletcher Sasse takes us back in time to the town of Saratoga, Nebraska that was at 24th & Grand in Omaha. What happened to Saratoga? Is there anything left? What’s the legacy and what about Sulphur Springs? Anything left of the Saratoga dock on the Missouri River? Is the Grand Hotel still there? Find out. Join the conversation about the history of Saratoga on Facebook! Join the conversation about the history of Prospect Hill Cemetery on Facebook! Join the conversation about the history of North 16th Street on Facebook! Adam Fletcher Sasse takes us back to the turn of the last century and exams the roots of riots and civil unrest in Omaha. He starts by examining the notorious bout of world heavyweight boxing champion Jack Johnson vs. James Jeffries in Reno Nevada in 1910, and explores what’s happened in Omaha before and after that. Join the conversation about the history of Omaha’s Jack Johnson riot on Facebook! Join the conversation about the history of Kountze Place on Facebook! North Omaha leaders include Mildred Born (1905-1989); John A. Singleton (1895-1970); Tanya Cook (1964); Whitney Young (1921-1971); and many, many others. In this episode, Adam Fletcher Sasse talks about early leaders in the Omaha community, including, believe it or not, Brigham Young! Also, learn about the founders of Florence, Saratoga, and Sulphur Springs, as well as the Kountze brothers. Join the conversation about the history of North O community leaders on Facebook! Adam Fletcher Sasse takes us back to the 19th century to let us know about Omaha’s earliest African American leaders including Silas Robbins, Dr. Matthew Ricketts, the Singleton family, John Grant Pegg and into the 20th century with Clarence Wigington and Mildred Brown. Join the conversation about of North O community leaders on Facebook! The North Omaha History Podcast episode 1 is about Manuel Lisa, Jean Pierre Cabanne and more related to fur trading in Omaha, Nebraska. Become a patron of the North Omaha History podcast today!